Announcing the MAGNER’S INTERNATIONAL COMEDY FESTIVALin Bangkok this April PHIL NICHOL is an energetic and exciting performer with an unquenchable thirst to break boundaries and innovate with his multi-faceted talents as an award-winning comedian, critically-acclaimed actor, producer, presenter, writer, and musician. His skill as an improviser goes unparalleled by anyone. With a surreal edge to his mischievous rantings, NICHOL always brings something new to the stage. His keen sense of fun and eye for the shocking and absurd has cemented his position as one of the best comedians on the circuit today – shown clearly by his record-setting six nominations for the Chortle Awards – Best Headliner/Club Comic. NICHOL’s 20 th visit to the Edinburgh Fringe Festival was marked in 2016, where he made the Telegraph’s list of the best jokes of the festival. NICHOL promises to give you a performance that you’ll never forget, putting you through a ‘rollercoaster ride of black comedy gold’ (The List). Don’t miss this masterful, mind-blowing, ‘seismically powerful award-winning comic force’ (The Scotsman) at the Westin Grande Sukhumvit this April. DANA ALEXANDER draws her fearless materialfrom her diverse lifestyle and raw life experiences. With an original and hilarious outlook, ALEXANDER began her comedy career at the age of 18, quickly being voted as Best Discovery by Canada’s Now Magazine.Before long, she began touring nationally with Yuk Yuk’s Comedy Clubs, allowing her to complete numerous television galas and radio spots. In 2011, ALEXANDER moved to the UK where she premiered her one woman show at the Edinburgh Fringe Festival, receiving rave reviews and nominations including Best Comic and Best International Act from Chortle and Black Comedy Awards. Soon after, she was featured on BBC television programmes, including Russell Howard’s Good News, Edinburgh Comedy Fest, and The Culture Show, and Canada’s popular stand-up show, Comedy Now. ALEXANDER has been named in the top 10 comedians three years running by Now Magazine and has performed in more than 40 countries worldwide. Don’t miss this ‘smart, irreverent and revolutionary’ (Now Magazine) powerhouse. SHAYNE HUNTERis an Australian comedy maverick. In 2010, HUNTER was selected for the prestigious Melbourne International Comedy Festival Comedy Zone. He toured every capital city, constantly sharpening his stand-up skills on the road, becoming one of Australia’s most original and interesting voices. Three years later, HUNTER decided to step back from the mic and focus his energy and voice as a political activist. Last year, HUNTER made a powerful return to the comedy circuit debuting his show, Blaze Against The Machine, at the Brisbane Comedy Festival, Melbourne International Comedy Festival, and Sydney Comedy Festival.HUNTER’s smart, poignant, and socially aware comedy pushes boundaries in any setting that is a backdrop for his biting, big-laugh perspective on life. It can be vicious, it can be raw, but it’s always hilarious.Don’t miss one of the cleverest comedians on the circuit, who will not only make you laugh, but will make you think. SAM SEE has entertained audiences from around the globe for over half a decade with his unique blend of jokes, stories, and improvised humour. Based in Singapore, he has starred alongside world-class comedians, including Dara O Briain, Bert Kreischer, Gina Yashere, Peter Berner and Kevin Bridges. SEE has appeared on MTV, iflix, and Comedy Central Asia and has been selected for numerous comedy festivals, including the Singapore Comedy Fringe Festival and Magner’s International Comedy Festival. The future is very bright for this whip-smart comedian. ‘Within seconds, he has the audience laughing, clapping, and clinging onto his every word’ (RICE MEDIA). SUNANDA SACHATRAKUL got her start as a comedian and actressafter winning Bangkok’s Magner’s Big V Competition in 2016.Since then, she has brought funny to audiences worldwide by touring with Magner’s in 2017, along with performing at various festivals including SF Sketchfest, Funny Women Fest, Comedy Comedy Festival, and at the world-famous Comedy Store in Los Angeles.People have also squealed with laughter during her sketch comedy at the popular Upright Citizens Brigadeand Groundlings in Los Angeles. SACHATRAKUL was invited to the pre-pre-preliminary audition for Saturday Night Live, and while her SNL career hasn’t taken off, there is no denyingshe will carry on bringing laughter to audiences across the globe. MEG ANDERSON is an American expat who hails from North Carolina. Originally starting her comedy career on a high school improv team, ANDERSON has since expanded her repertoire to include stand-up comedy and creating communities wherever she moves to. She specializes in character work and being a big ham – AKA someone who enjoys performing in an excessively theatrical way. ANDERSON has been living in various parts of Asia for nearly a decade and currently resides in Bangkok where she works as a voice-over artist and flourishes as a lazy housewife. 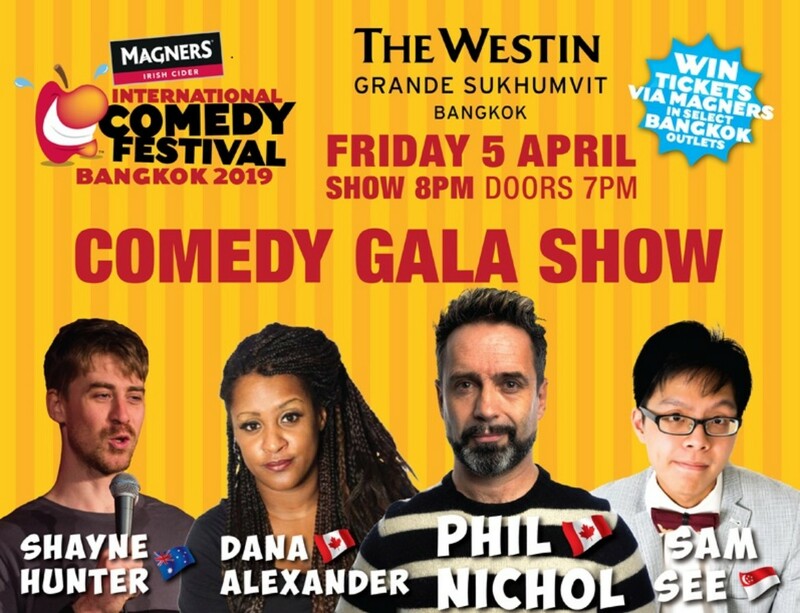 Do not miss PHIL NICHOL(CAN)with special guests DANA ALEXANDER (CAN), SHAYNE HUNTER (AUS), SAM SEE (SIN), SUNANDA SACHATRAKUL (IND),and MEG ANDERSON (USA) at the Magner’s International Comedy Festival Gala Showthis April at the Westin Grande Sukhumvit. 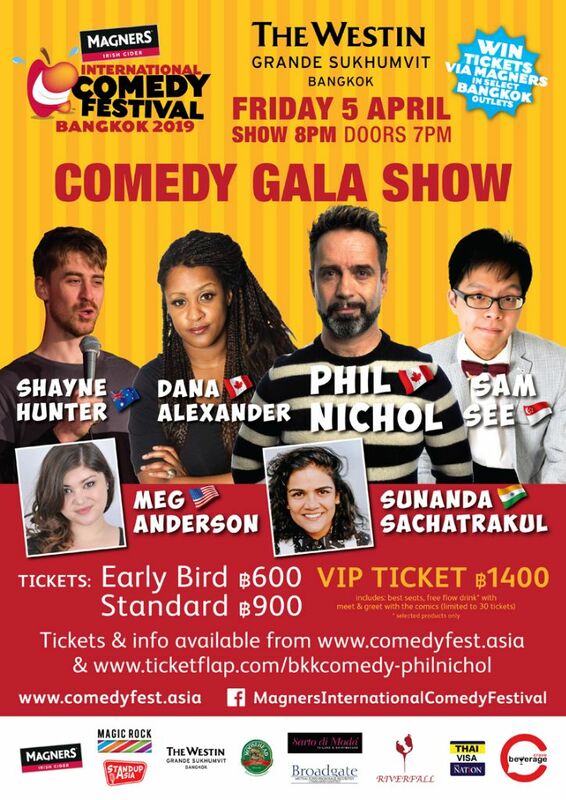 Early bird tickets are on sale now for 600 THB, 900 THB at the door, or 1400 THB for VIP tickets, which includes free-flow drinks before the show and during the break, meet & greet with the comedians, and the best seats in the house.